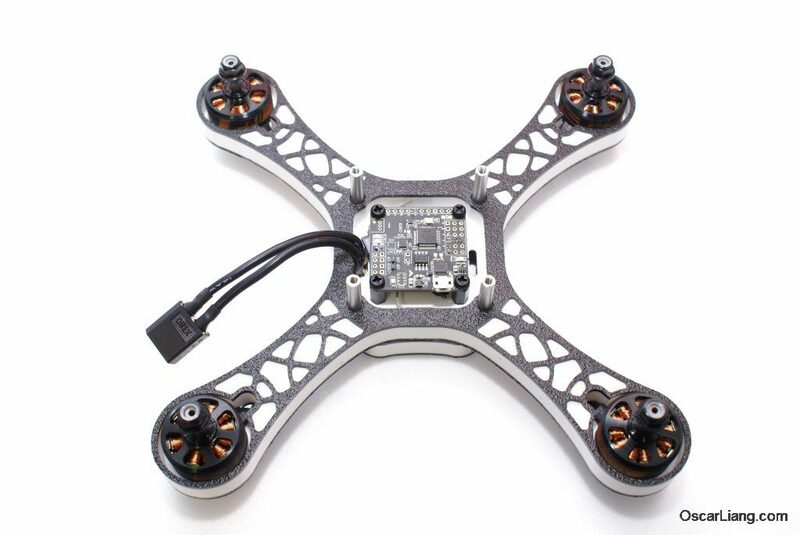 The WBX 5″ Mini Quad frame is designed and manufactured by a UK based company. It has an unique, crash resistant design. 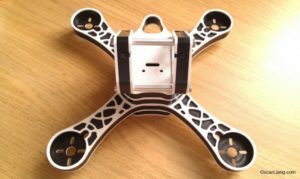 We have seen enough carbon fibre mini quad frames, it’s exciting to know that the WBX frame is made from HDPE, a type of plastic that has high strength-to-density ratio. Get your WBX 5″ frame from RaGG-e.co.uk. The diagonal motor to motor distance is 205mm (branded as 210 frame though). It weights 162g assembled. Supports 5″ Propellers. There is also a 6″ version of this frame. Some of the included plates are optional, you can install them, or leave them out to save weight. The interesting design is really eye catching. My first impression was how stiff and tough it is, but it’s also pretty heavy. However your electronics such as the FC and PDB can be well protected. I have yet to get the parts for building this frame, so RaGG provided me with some build pictures of this frame, to give our readers an idea where the components can be mounted. You can drill holes and modify the frame to make it easier for your needs. There is no right or wrong way to build this frame. The PDB sits under the main frame. The frame supports 22xx motors, and the motors are well protected by the motor mounts. The motor wires can be routed through the hole and reach the PDB under the arm. If you are following these pictures for your build, then you will have to drill the holes on the bottom bay to allow the ESC signal/power wires to go though. Here is the flight controller, you can see that there is plenty of space left after the FC is installed. Cables can pass though from the PDB to any electronics above the FC. The WBX is designed to use the HS1177, Runcam Swift or any other cameras that use this sort of brackets. The holes for the VTX antenna is not on the frame originally, you have to drill it yourself. And finally with the camera cage installed. A clean and solid build. I am seeing more and more 3D printing designed parts for the WBX 5″ that improve user experience. RaGG-e is working on some alternative bottom and top plates, using lighter material such as G10 or Carbon fibre to reduce the total weight of the frame. They manage to drop the weight down to around 106-110g. These plates will be available in a couple of weeks and can be purchased separately. We are now building this quad, the build log can be found here. 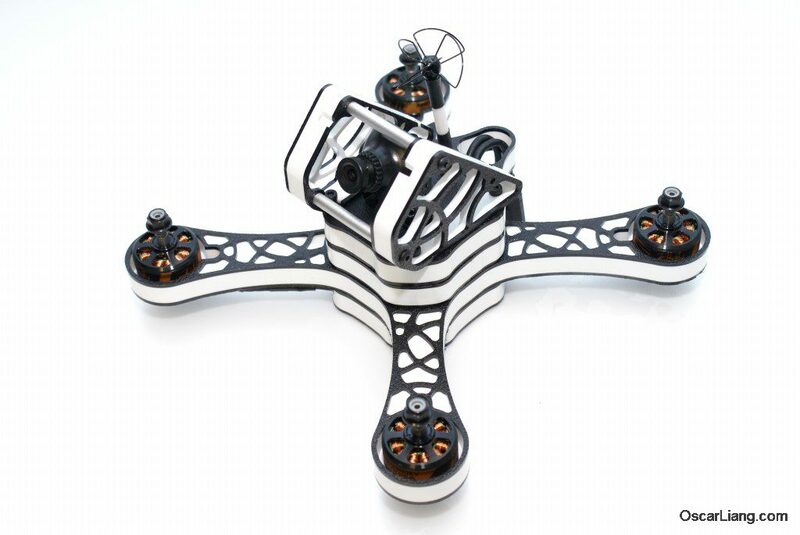 Oxfpv also has two HDPE frames, I guess you can say a true-x racer and h-frame freestyle. I grabbed the racer can’t recall name, wasn’t catchy I guess but yes it’s a tank. Solid and heavy. It’s my basher quad to remove my stuck in tree quads lol. No I don’t bash it into my quad but it’s good at taking branch beatings that loosen the trees hold and quad drops lol. It’s really not that much fun to use otherwise cause of the weight. Needs powerful motors that kill batteries thus has low flight time. How do you get the STL files for these things? Looking to design some 3d printed accessories, maybe some for the fossilstuff gravity too. It’s not unique, check out the Fossils Stuff frames which Ragg-e was “inspired” by..
fossils stuff is nothing like the wbx5… they are both made from HDPE thats about it.. Incorrect but hey ho, in the end the stuff learnt whilst working for FS was taken and used to design these, including things in development at the time like the FSGX. Like the gopro session Mount on the last Picture…. Any chance of a thingiverse link? Cant find it….